This dancing Grandpa and his whacky tools are ready for fun projects in the workshop! 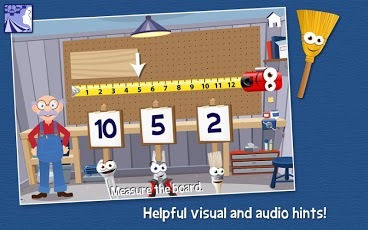 Created by the makers of the wildly popular "Grandma&apos;s Garden", Grandpa&apos;s Workshop includes seven action-packed mini-games loaded with educational content for kids ages 2-6. Plus, your kids will... see more This dancing Grandpa and his whacky tools are ready for fun projects in the workshop! 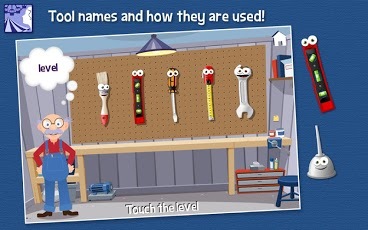 Created by the makers of the wildly popular "Grandma&apos;s Garden", Grandpa&apos;s Workshop includes seven action-packed mini-games loaded with educational content for kids ages 2-6. Plus, your kids will get to choose parts to build their own colorful clubhouse! 2. Board Fractions. 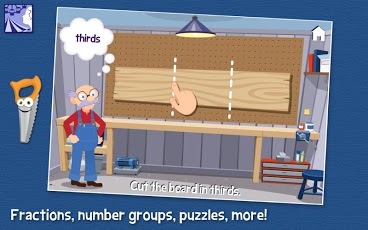 Let&apos;s cut the board into halves, thirds, or quarters and count how many pieces we have! 5. Number Groups. We&apos;ll need 4 springs to finish up this project... which jar has 4 springs? 6. Puzzle Fix-Up. Oh no! Grandma&apos;s plate is broken! Let&apos;s piece it back together. Grandpa&apos;s Workshop was developed by an Educational Psychologist and parents for children ages 2 through 6.